The early years of Scott Walker, including his much discussed time at Marquette University. Excerpted from a new book. Scott Kevin Walker was born November 2, 1967 in Colorado Springs, Colorado, to Patricia Ann (née Fitch) and Llewellyn Scott Walker. Scott has one brother, David. The family moved to Wisconsin when Scott was ten years old. Llew was a Baptist pastor, which let Walker label himself a preacher’s kid when it worked for his political career. In 2008, 76% of Wisconsin’s population self-identified as Christian. Walker and his family currently attend a non-denominational evangelical church in Wauwatosa. In 2009, Walker spoke to The Christian Businessmen’s Committee in Madison, Wisconsin and made clear his calling. The speech is still available on the internet. Walker told this group that about the time many budding conservatives were casting a first vote for Ronald Reagan, he was committing to Jesus. In a 2002 article, prior to his election for Milwaukee County Executive, Walker allowed a different image to emerge. The article touts how Walker formed a “Jesus U.S.A.” club at the age of seven. Imagine a young Governor Walker skipping down the sidewalk holding a coffee can with a sign taped to it: Jesus U.S.A. Club. Picture the little tyke knocking on doors giving each neighbor a spiel to raise money for a flag pole. Now, fast forward forty years as Walker raises money to campaign. The article also said, “As a teenager, he would sometimes serve as a stand-in preacher for vacationing area Baptist ministers during the summer.” No doubt, that is where he honed his speaking skills. Walker does not use a teleprompter. He does not even use notes to convey his message. Watching Walker’s speech at the 2012 Republican National Committee convention, his awkwardness was apparent to those who have heard him speak. The teleprompter stood in his way of his normal smooth delivery. Those thoughts had been there a while. 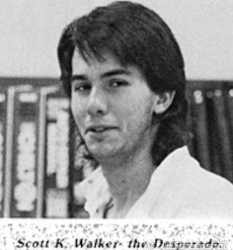 In 1985 while attending Delavan-Darian High School, Scott Walker was selected for Badger Boy’s State – a week-long program of mock state government. He was then chosen to attend Boy’s Nation, another week of mock-government programming sponsored by the American Legion. Walker graduated in spring 1986. The high school yearbook has several photos available online, including one labeling Scott K. Walker “the Desperado” which is pictured below. Scott K. Walker “the Desperado”. Photo from the Delavan-Darian High School Yearbook. A member of the 2010-11 Delavan-Darian high school yearbook staff asked Walker for a history on the photo after he became governor. Walker really did not remember, but offered that a long-time schoolmate of his was the yearbook editor, and he probably had more photos in there than he deserved. For those of us from the mullet era, the picture is just darned cute. After high school, Walker attended Marquette University from fall of 1986 to spring of 1990. During that time, he returned to the American Legion programs as a counselor in the summers. Walker lost a 1988 bid for Marquette Student President, but did not leave college. Though rumors persist he left because of discipline attached to the actions of his campaign for the race, there is no evidence of it being fact, nor does the timing fit his exit. Walker did not earn a degree from the university. There are inconsistencies in his departure. For one, earning a triple major in four and a half years would be quite an accomplishment requiring a great number of credits. That total would have been for one degree as Marquette generally requires 120 credits to graduate. Walker’s Hilltop interview said he was expecting three degrees. Another persistent rumor never proven is that Scott Walker left Marquette University for academic dishonesty. Research with several who made the claim could offer no more proof than their own opinions. Other interviews, including one with a former dance date, indicate Walker left for financial reasons. It simply became too expensive to stay. This assumption also fits with another piece of evidence: The State of Wisconsin filed in court to collect taxes against Walker’s parents in 1987. A Washington Post biography of Governor Scott Walker says Walker is the first Wisconsin governor in 64 years without a college degree. But Walker now has his eye on a national office, bidding to join the rare group of U.S Presidents without a college degree. Harry Truman, 1945-1953, was the only President in the 20th century without one. Before Truman it was Grover Cleveland in the late 1800’s. If you ask Kilkenny, she’ll say Walker is a great governor. She’ll also say she’s a great writer. If Walker really is going to run for presedent, this MU secret will have to come out. Most Liberals are not interested in the truth when it does not further their agenda. Barry and Weisberg make completely unsubstantiated charges against the Governor and are not forced to show proof. Rumor has it there is a new book being penned about Tom Barrett and that proceeds from the the thriller will be directed toward a cure for insomnia. Someone should tell Cindy Kilkenny that Scott Walker’s family moved to Wisconsin from Plainfield, Iowa – not from Colorado. A 5 second Google search would have turned that up. @Zach You are correct. I’ve removed “from Colorado”…. And we’ll fix it better in the morning. Ouch. That was indeed embarrassing. I went back through my research where indeed I had that detail, but I lost the fact in the editing. I’m so sorry. I worked hard on this, but evidently I’m not ready for prime time. I’m really lucky to have places like this where it can be vetted. I’m bet “The Chris Byhre Story’ would be a real page-turner. HomerJay, what is your point or does having a point require too much thought on your part? My point in my earlier post was to illustrate that unsubstantiated accusations against Scott Walker need to be backed up or rescinded. I also mentioned Barrett because he is an abject failure as a mayor and a complete empty suit. Therefore, any book written about a man who does not want the job he has and has failed numerous times to get a different job would be boring in my opinion. I never compared myself to the Mayor, why did you feel the need to insert me into the argument? Chris, You started this stream of unconsciousness! ohbrad, exclamation points do not make your statement more relevant or coherent for that matter. I suspect you are incapable of stringing together thoughts in a semi organized fashion, but if you can, we could have a debate. I’m sorry you’re so lonely. I couldn’t have paid two people to behave this way and cover so well for me. If they’d been on your own web site, you could’ve simply deleted their comments and banned them. Nah. You’re just a really special person, John. That’s why you were canned. You are more than welcome to return if you promise to think before you type. In the 2000 census, Plainfield had 438 residents and two “notables” One was a football player by the name of Pagel. The other was Scott Walker. Iowans love their football. You’re right Chris, it was a stupid flippant comment I shouldn’t have made. This is an article about Scott Walker, and it irks me when the way to defend someone is to badmouth someone else as being worse. Barrett had nothing to do with this article. JRM, that’s in the book, but later under a section on his history as a politician. I chose to separate the issues because of the Professor’s comment that it would never have caused academic expulsion. The part about Walker’s political history is interesting to me because of the different personas he adapted for various campaigns.